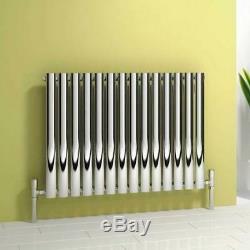 Reina Nerox Stainless Steel Horizontal Designer Radiators. Single and Double Panel options available. Manufactured in accordance with BS EN 442. Supplied with wall mounting brackets and fixings. Heat Output BTU (Delta T50). Heat Output BTU (Delta T60). Radiator Wall To Pipe Centres. 600mm x 413mm Single Panel. 600mm x 590mm Single Panel. 600mm x 826mm Single Panel. 600mm x 1003mm Single Panel. 600mm x 1180mm Single Panel. 600mm x 413mm Double Panel. 600mm x 590mm Double Panel. 600mm x 826mm Double Panel. 600mm x 1003mm Double Panel. 600mm x 1180mm Double Panel. Simple, elegant and stunning, the Reina Nerox Stainless Steel Designer Horizontal Radiator is an eye-catching design with outstanding performance. With its beautiful ovoid profile heating tubes and a choice of a subtle brushed finish or the more dramatic mirrored style, the Reina Nerox is designed to help you create the perfect modern heating environment for your home. Reina are the leading manufacturers of radiators in the UK, and their products combine functionality and strong design aesthetics to create heating solutions that are capable of transforming your home. Available in five different widths and in both single and double panel configurations depending on your heating needs and the space available, there's a Reina Nerox radiator that's perfect for your needs. Manufactured from robust and corrosion resistant stainless steel, the premium choice for high performance radiators, the Reina Nerox range are supplied with a 25 year guarantee for complete peace of mind. Powerful and elegant, the Nerox horizontal radiator provides the perfect finishing touch for any room. Range of standard and thermostatic valves available separately. Designer Radiators and Single or Double Panel - Explained! Rest assured the Designer radiators have been manufactured to combine both functionality and stylish design, so you wont go cold in the winter months. Unlike Column and Convector Radiators, a lot of the Designers come in Horizontal or Vertical Orientation. The Verticals can be the perfect solution when trying to maximise wall space in your home, while the Horizontals are modern and stylish, but more traditional in orientation and release heat in the same method as the convector radiators do. Whereas, a Single Panel Radiator only has one panel which faces away from the wall. Because the design puts one panel behind the other, the height and width of the radiator will stay the same whether you choose single or double panel. Compared to the Single Panel options, the Double Panels will produce more heat because they have more surface area to warm the air in the room. You should bear in mind that this extra heat from a Double Panel will come at a higher cost. You will need either angled or straight valves. Angled if your pipes are coming from the wall as this will provide a 90 degree angle up into the bottom of the towel rail / radiator, straight if your pipes are coming from the floor and just need to go straight up into the bottom of the towel rail / radiator. If the towel rail / radiator has connections at the sides. You will need either angled or corner valves, angled if your pipes are coming from the floor as this will provide a 90 degree angle into the side of the radiator. Corner Valves if your pipes are coming from the wall this will also give a 90 degree angle into the side of the radiator however is the neatest solution with this type of configuration. The item "Modern Designer Stainless Steel Horizontal Radiator Central Heating Reina" is in sale since Saturday, December 22, 2018. This item is in the category "Home, Furniture & DIY\Heating, Cooling & Air\Air Conditioners & Heaters\Radiators".